November 6, 2015 from 6-8pm. Garden Street Studio (303 N. Garden) – Open House (Free 6:30 class with Amy Figueroa for the first 10 people). 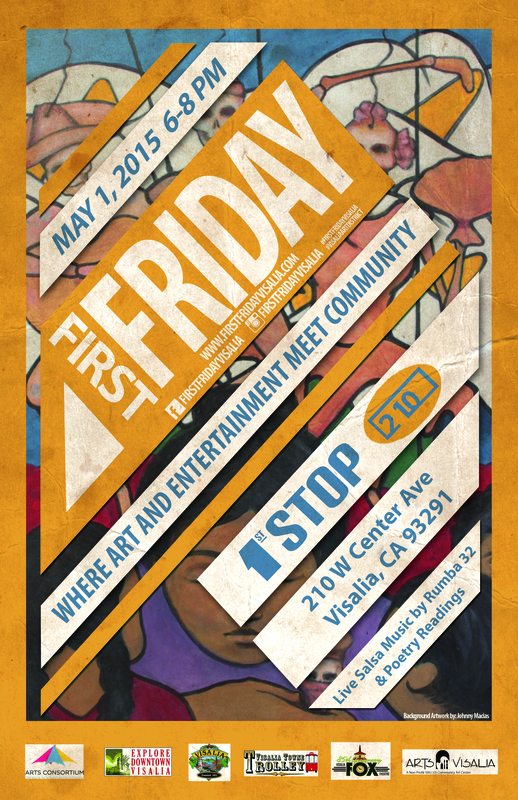 First Stop: Arts Consortium – 400 N. Church St. – It’s a pARTy at the Arts Consortium! Get your newly released Taste the Arts Magazine. Listen to local folk favorite Tipperary Stew while you browse the VIsalia Visual Chronicle collection. There is a “Cake Walk” every half hour with plenty of fabulous prizes like tickets and apparel. Don’t miss the photo booth either! 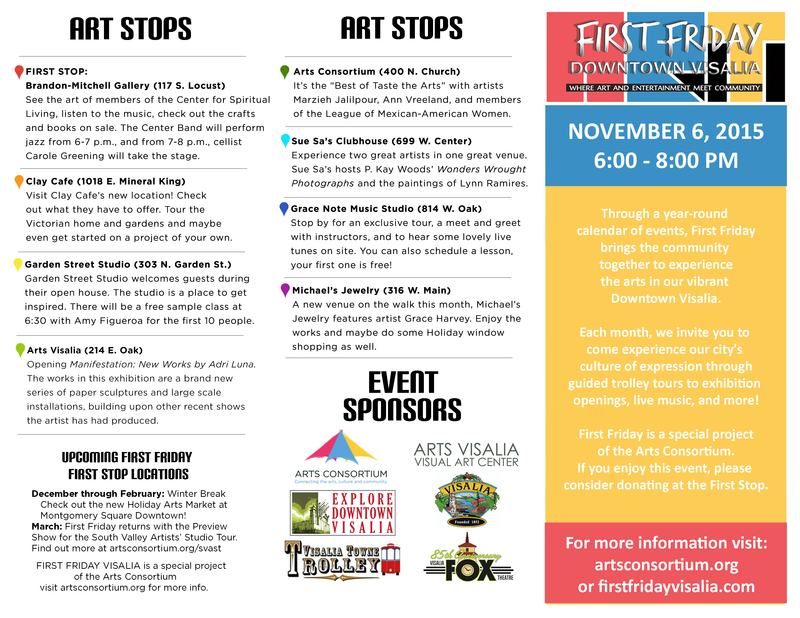 Arts Visalia – 214 E. Oak Ave. – Pixel Impressions – Featuring Artists: Joan Constable, Elsah Cort, Robert Mertens, Brent Mosley, Wayman Stairs, and Susan Thompson. Please note that Cafe 210 has postponed their hand-weaving arts exhibition. They will not be featured on the art walk this month. Stay tuned for that great show in the coming months! SUE SA’S CLUBHOUSE WILL NOT BE OPEN FOR THE SEPTEMBER FIRST FRIDAY. 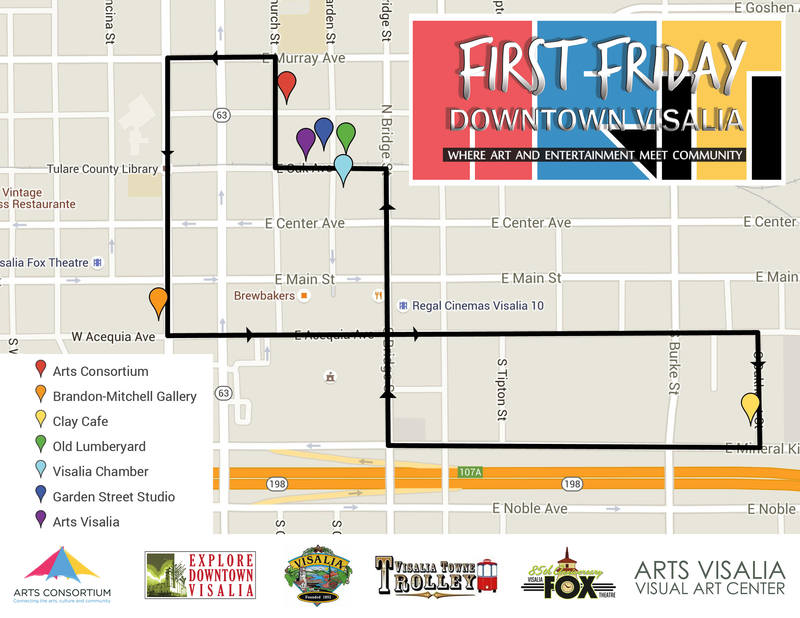 We apologize for First Friday’s error. We appreciate Sue Sa’s commitment to this event and will keep you updated on their next reception. Thank you. See the other great venues on the tour below! First Stop: Jon Ginsburg Gallery (410 E. Race or 606 N. Bridge … depending on how you approach the lot): “Under the Harvest Moon” is an invitational show featuring the works of area artists as well as The Creative Center’s talented artists. A fall theme prevails through the art work and the artist participating have kindly agreed to donate 20% of their sales to the Creative Center. We are also planning on a Fall Dessert Bar and live music! P​lease come out and support our wonderful facility and buy some art! 210 Cafe (210 W. Center): Featuring the photography of Ralph Chojnacki. Grace Note Music Studio (814 W. Oak): Stop by for an exclusive tour, a meet and greet with instructors, and to hear some lovely live tunes on-site. Brandon Mitchell Gallery (117 S. Locust): Presenting two young artists from the Bay Area. Arts Visalia (214 E. Oak): Arts Visalia is pleased to present Paintings of California & Beyond, an exhibition featuring the work of Kenneth Conn. Conn’s work truly captures the vast expanse and character of California’s Central Valley within the medium of oil on canvas. Arts Consortium (400 N. Church): “Art from the Vine”. Featuring 9 artists from the Central California Gourders (CCG), the exhibition showcases the variety of uses, traditions, and artist workings of the Lagenaria gourd. The event also offers an educational component with hands-on activities and a demonstration by members of the CCG. They will provide live music with the thumb drum and other instruments made from gourds. First Friday First Stop: Old Lumberyard (Corner of Oak and Garden) featuring the Urbanist Art Collective and their presentation of Rural Murals. After Film: Student Performances, Live Beats by Humble Weight @thelowkeytheory, Workshops, and Open House Experience. 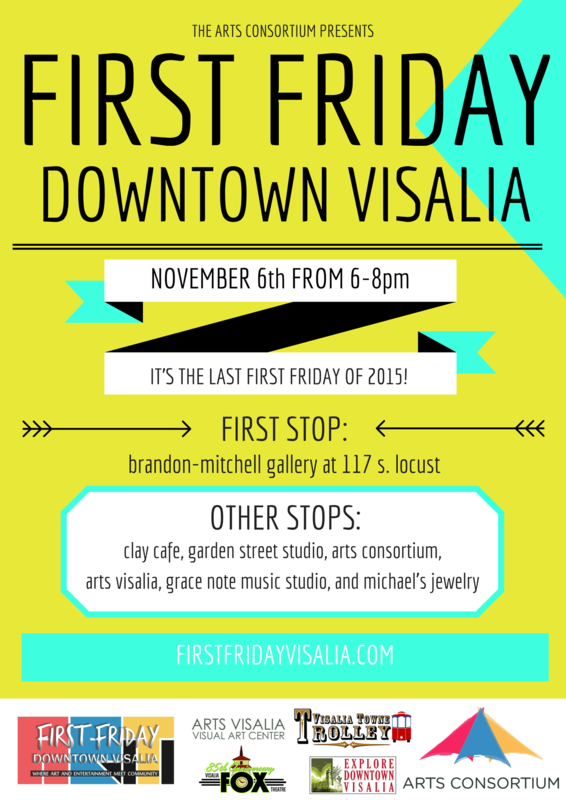 Arts Visalia (214 E. Oak) featuring the Young at Art 2015 Exhibition. Arts Consortium (400 N. Church St.) featuring works from the My Voice Media Center. Jon Ginsburg Gallery at the Creative Center (606 N. Bridge) featuring Julia Tanigoshi Tinker. Live demonstration by Tinker beginning around 7pm. Cafe 210 (210 W. Center) featuring artist Teresa Zappy. Sue Sa’s Clubhouse (699 W. Center) featuring artist Deanna Saldana. (Get a head start: this reception begins at 5:30pm). Grace Note Music Studio (814 W. Oak Ave.) featuring live musical performances. Brandon Mitchell Gallery (117 S. Locust) featuring the large-scale dragon inspired art of Debbie Shane. Live artist discussion beginning around 6:15pm. (Get a head start: this reception begins at 5:30pm). 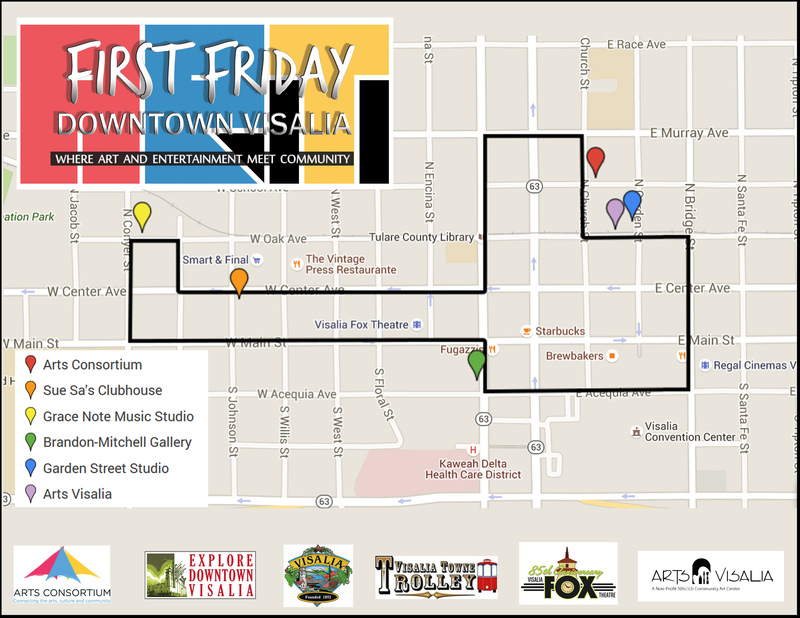 No First Friday in July. See you in August! 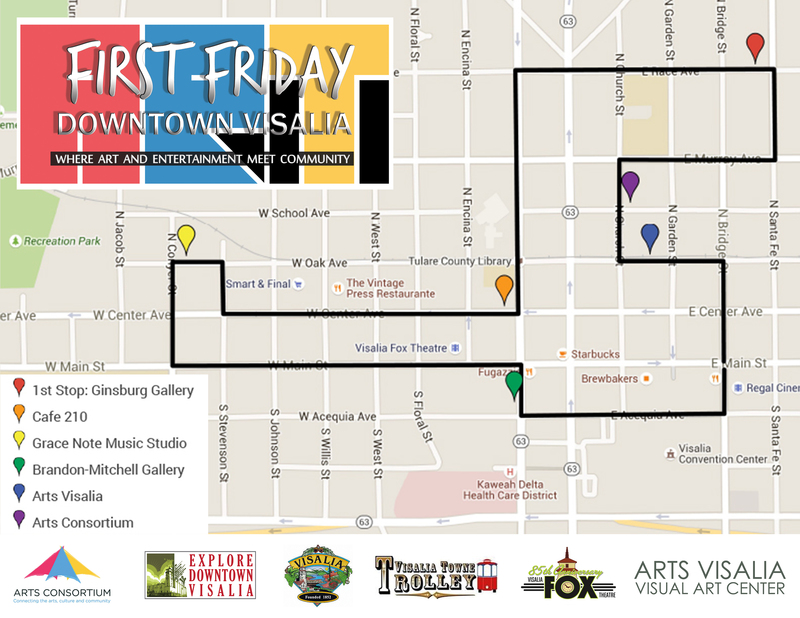 First Friday Downtown Visalia will not take place this July. We take a few months off each year to keep you wanting more! Enjoy your Independence Day. We will be back on August 7th with the Urbanists Collective at the Lumberyard on Oak and Garden as our First Stop. Many of our venues will still be open on July 3rd for receptions and activities so please do check in with them for more information. Thank you for your support these past few months as we have revamped this event, we hope you are enjoying it as much as we are. The Arts Consortium hosts the grand reopening of their new gallery and multi-purpose art space. The exhibition Variance: Unconventional Landscapes features a variety of mixed media works from artists both local and national, exploring the different ways in which we experience and interpret the world around us. The musical group 2 Nice Guys will also be performing. Sue Sa’s hosts artist Grace Harvey with her portrait, still life, and landscape oil works. Harvey grew serious about painting in 1999 when she was in between jobs. She began at the Senior Center in Visalia and continued with several instructors to learn the technique. She has taken drawing classes at COS. For Grace, “Creating something from a blank canvas is a journey”. Stop by for an exclusive tour, a meet and greet with instructors, and to hear some lovely live tunes on-site. Grace Note Music Studio is Visalia’s premiere music school. They offer private one-on-one music lessons with professional musicians on nearly all musical instruments. Schedule a lesson with them, your first one is free! The exhibition Colorful Interpretations hosts artist Sharon Banister and her acrylic paintings depicting historical buildings of downtown Hanford along with landscapes and still-life works. Garden Street Studio will be welcoming guests during their open house. The studio is a place to get inspired, motivated, and find your artistic groove. Check out their space, get a taste of the classes, and get to know the artists on staff. Experience Black & White Revisited (Shades of Grey). Arts Visalia is proud to host the annual Visalia Art League Members Exhibition, featuring artworks in a variety of media by local artists. The Visalia Art League is an educational and philanthropic organization open to amateur and professional artists, as well as non-artists who are lovers and patrons of the arts. Friday May 1st, 2015. 6:00pm-8:00pm. 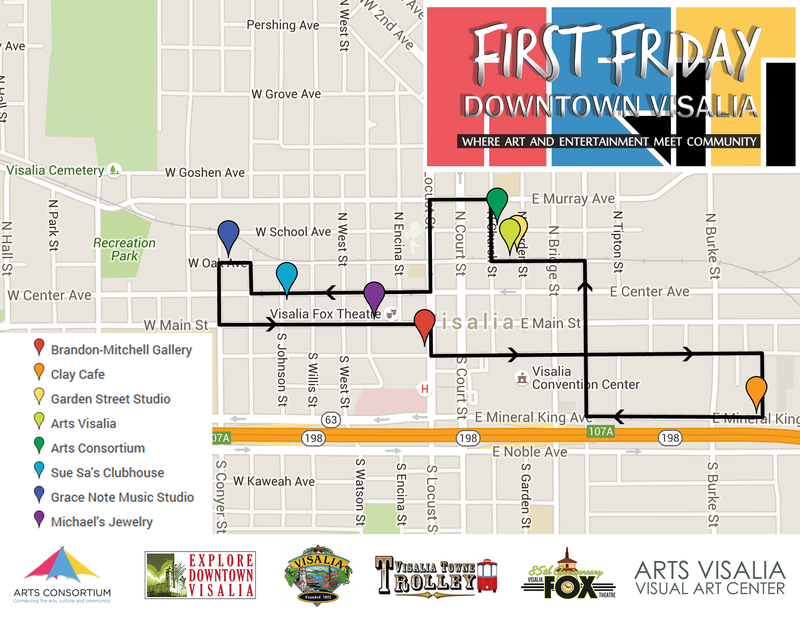 Downtown Visalia. Pick up your map here at the start of the night. Listen to the sweet Latin tunes of Rumba 32. Experience the poetry of Vocal Canvas. 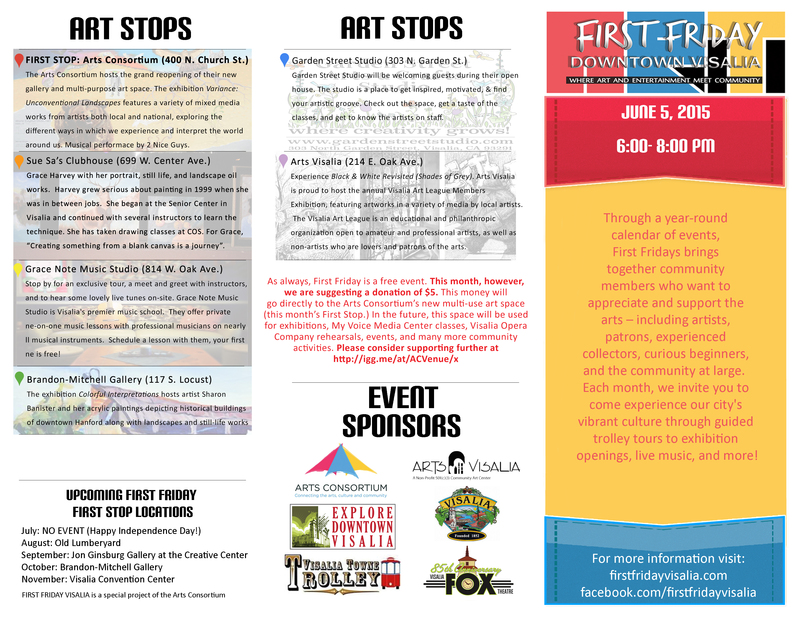 See the artwork of Richard Arenas, Johnny Macias, and Amy Figueroa. Garden Street Studio (303 N. Garden St.) Open House. Bring your family and friends. Hop on the docent-led trolley to save your feet. 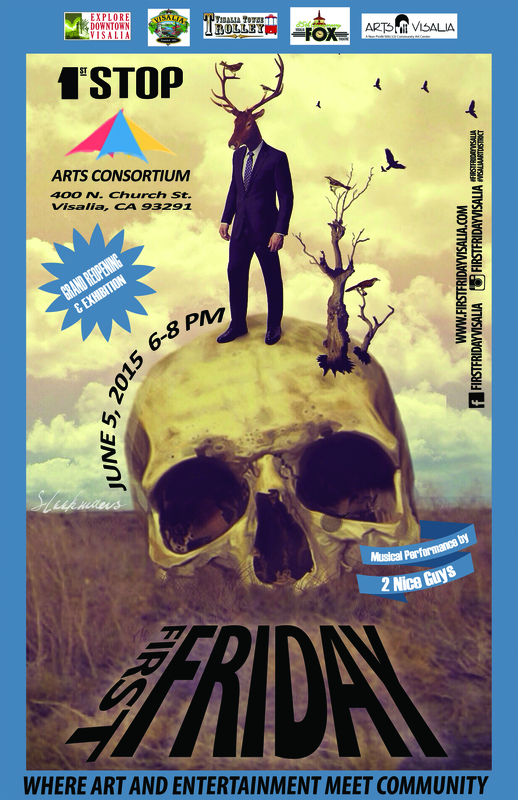 Call the Arts Consortium at 559.802.3266 for more information. 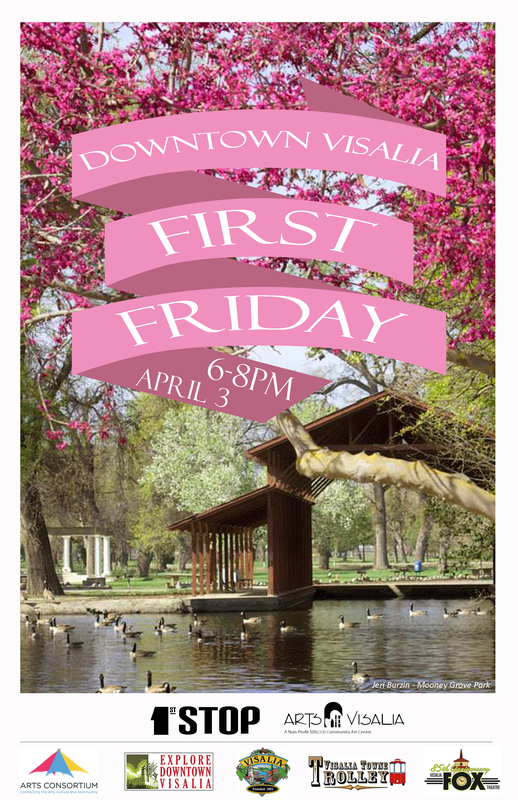 Many thanks to the Visalia Times-Delta for the recent press about the April 3rd First Friday program! 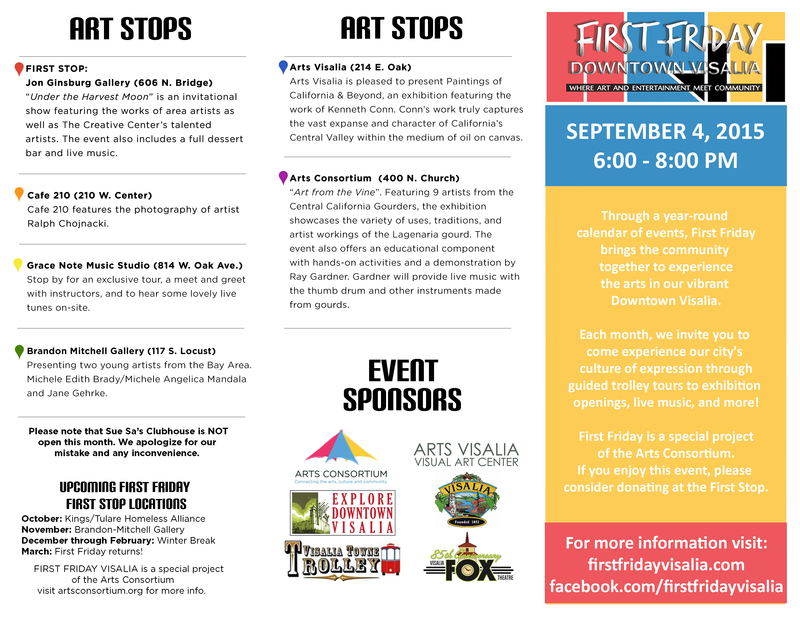 In addition to the venues listed in the article, the free Towne Trolley will also be taking visitors to 210 to view the College of the Sequoias Art Club show. 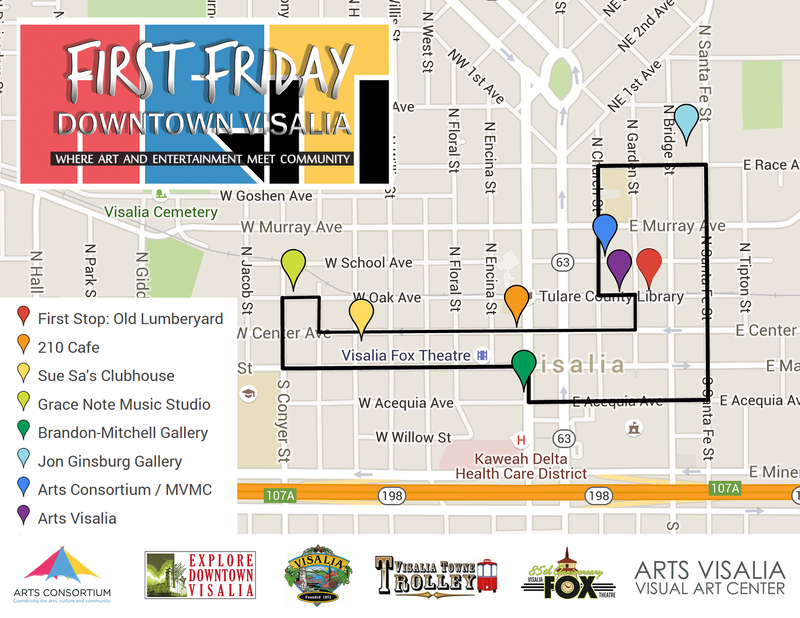 We’re also happy to announce that live music at Arts Visalia will be provided by the Visalia Music School. 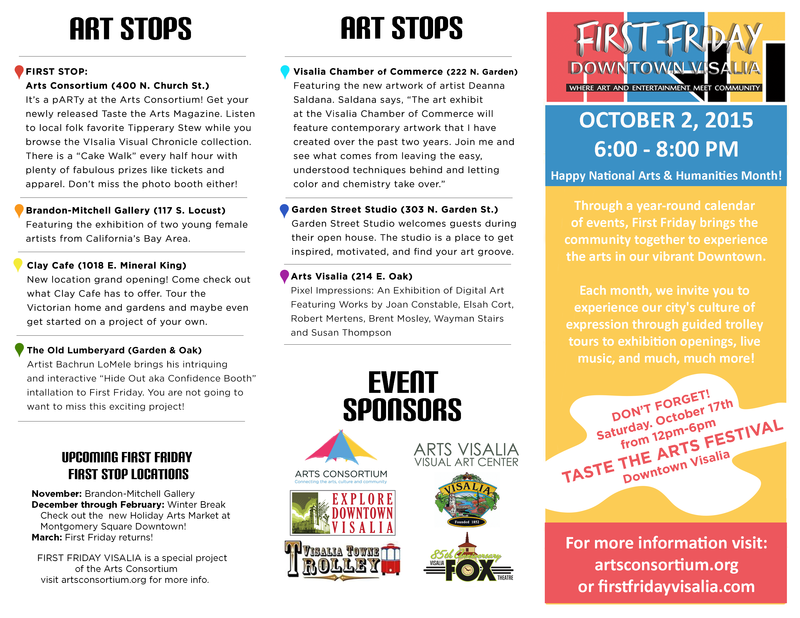 Hop aboard the free Visalia Towne Trolley to visit these additional Art Stop venues: The Jon Ginsburg Gallery at the Creative Center; Country Roads Studio; 210 Cafe; Kings/Tulare Homeless Alliance; Brandon-Mitchell Gallery at the Spiritual Awareness Center; the Visalia Convention Center.